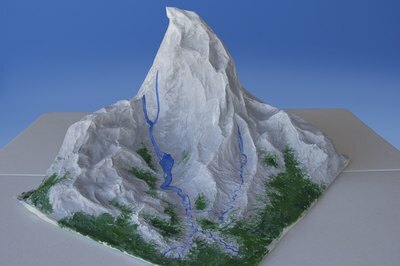 Models can be expensive, especially if you are looking for a large-scale element such as a mountain. 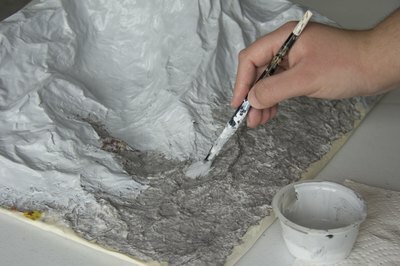 If you are a hobbyist or student who needs a mountain for your model, you can save a lot of money by making a mountain yourself. All you need to make a mountain form are paper scraps and supplies you probably have lying around your kitchen right now. With some paint and accessories you can give it a finishing touch to make it look authentic. Find a sturdy base made of wood or cardboard that is wider than the size you want your finished mountain to be. Choose a base for the mountain model. 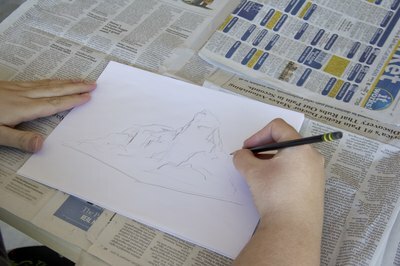 Sketch a rough image of the mountain you have in mind. Think about how steep you want it, how many peaks you want, and estimate the overall height and width. 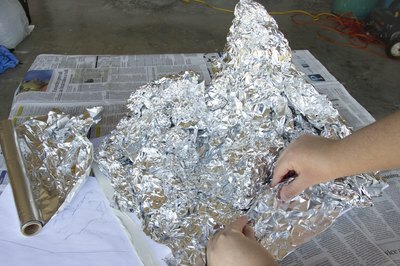 Crumple large sheets of aluminum foil loosely to create an frame for the structure. 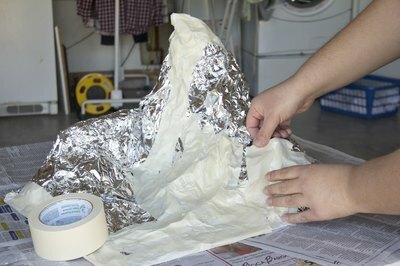 Shape the foil the way you want your mountain to be shaped, making peaks and valleys. Let the shape taper off so it spreads out naturally. Glue the foil structure to the base, molding it and forming it, adding more foil if necessary, until you are satisfied with the shape. Create a frame with foil. Cover the entire foil mountain frame with a layer of paper packing tape. This helps to hold the shape and provide a smooth, absorbent surface for the paper mache to adhere to. Use paper packing tape to hold the frame together. Pour a gallon of warm water into a large plastic bin. Cut or tear newspaper into 1-inch to 2-inch squares. 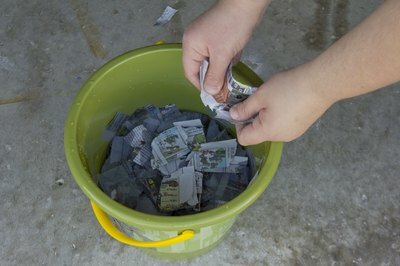 Add enough newspaper scraps to the water until you have a soupy mixture. Pour 2 to 3 cups of the mixture into a blender and puree the paper. Add more water if the mixture is too thick. Pour the pureed mix into a fine sieve to drain away excess water, then place the paper mache pulp into a large bowl. 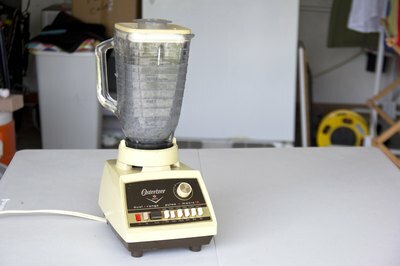 Make paper mache pulp with a blender. Puree the rest of the paper into pulp in 2- to 3-cup increments and add the pulp to the bowl. Mix the paper mache pulp with white craft glue and 1/4 cup of table salt until it's thick, wet and pasty, like the consistency of creamy oatmeal. Paper mache puree should look and feel like oatmeal. Scoop some of the pulp in your hand and begin spreading it over the mountain shape. Start from the bottom at the base and work your way up the mountain peaks. Form the mountain with paper mache. 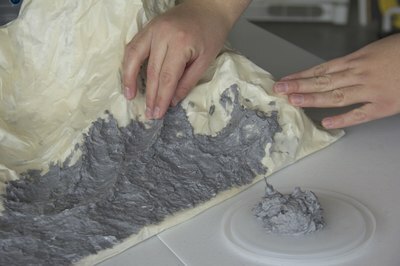 Add details to the mountain with the paper pulp if desired. 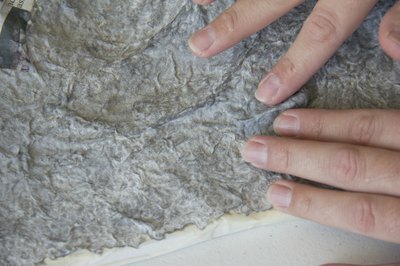 Create ridges by making a thin line of pulp and pinching it. Put two ridges next to each other to look like a stream. Make small foil balls and cover them to create boulders. Allow the structure to dry overnight once you are satisfied with it. Preserve the leftover paper pulp in a sealed plastic storage bag in the refrigerator. Enhance the model with details. Paint the mountain with acrylic paints. Think about which direction the light would hit it, and use a lighter color on that side. Paint the other side with a color that's two or three shades darker to indicate shadows. Paint details, such as blue streams and a white snow cap. Paint the model as needed. 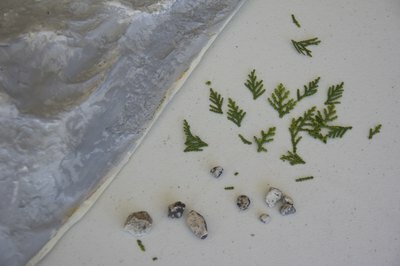 Hot-glue miniature evergreen branches, pebbles and twigs around on the mountain if you want to add trees and realistic natural details. Add miniature details to make the mountain look real. 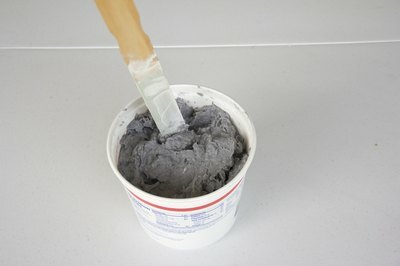 Be sure to use paper packing tape, as paper mache pulp will not adhere well to duct tape, rubber or clear plastic tape.